Since my last update on the elimination of Syria’s chemical weapon (CW) capacities in May, all precursor chemicals have finally left the country. Some have been shipped to facilities in Finland and the USA, where they are in the process of being destroyed. The United Kingdom meanwhile completed the destruction of 190 tonnes of chemicals at an incinerator in Ellesmere Port. As of 7 August, 74.2% of Syria’s entire stockpile of chemical warfare agent precursors have been destroyed. Other chemicals are meanwhile being neutralised on board of the US vessel Cape Ray in the Mediterranean, and the resulting reaction mass will eventually be commercially incinerated too. The Organisation for the Prohibition of Chemical Weapons (OPCW) is gradually slipping off the radar screen of international media. The huge pressure of safely evacuating the precursor chemicals from the war-torn country now removed, the organisation can slowly return to its more familiar role in the background of international politics: monitoring compliance with the Chemical Weapons Convention (CWC) and resolving any outstanding issues. Syria will increasingly become more integrated as a ‘normal’ member of the OPCW. This, however, does not mean that the OPCW will relax its efforts to achieve full accounting of its chemical warfare programmes, clarification of allegations of CW use, or complete destruction of all relevant declared facilities. Syria’s recurring amendments to its initial declaration of 23 October 2013 demonstrate the grinding, but nonetheless steady progress the OPCW is making. Two new elements (at least to outsiders) have surfaced over the past couple of weeks: Syria’s presentation of a destruction plan for abandoned chemical weapons (ACW) and the declaration of a CW production facility dedicated to ricin manufacture. The UN Secretary-General’s latest monthly progress report on the elimination of Syria’s chemical warfare capabilities refers to Syria’s submission on 14 July of a destruction plan for two sarin-filled munitions. Syria denies ownership of these CW and has therefore declared them as ACW. 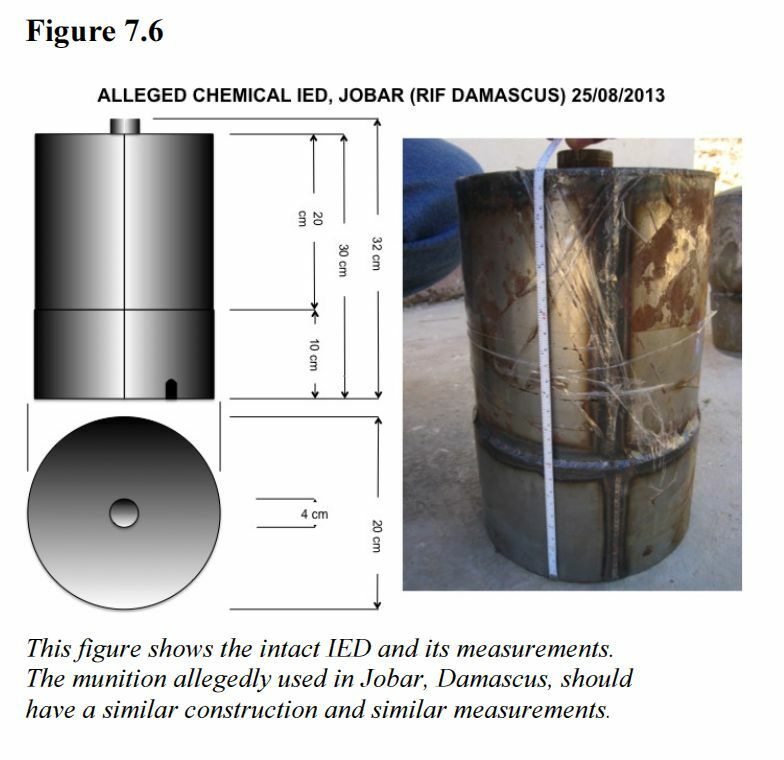 The two munitions were recovered after the CW attack at Jobar, an eastern suburb of Damascus, on 24 August 2013 (i.e., three days after the Ghouta chemical attacks). Four days later, Syria notified the UN Secretary General of the use of an improvised explosive device (IED) releasing a foul and strange odour. The UN team investigating alleged CW use visited the site on 29 September. It was unable to examine the place of impact or recover munition fragments, because mine clearing operations had completely corrupted the surroundings. Syrian officials handed over IED fragments and contaminated soil samples, which they claimed came from the incident site. For obvious reasons, the UN team could not certify their chain of custody. Analysis of their contents by the OPCW confirmed sarin as their payload. Moreover, the filling displayed all the characteristics of sarin as produced by the Syrian government, the principal telltale sign being the presence of hexamine (hexamethylenetetramine). Since its presence in samples was first reported by the UN investigative team last September in relation to the Ghouta attack and the OPCW later released that Syria had declared 80 metric tonnes of the chemical in connection with sarin production, there has been furious speculation as to its exact role. In a recent analysis focussing explicitly on the role of hexamine, UK-based CW expert Daniel Kaszeta argued that the Syrians used the compound as an acid scavenger in the final reaction of their rather unique sarin production process. Reacting DF (methylphosphonyl difluoride) with isopropanol yields sarin and hydrofluoric acid, the latter being a toxic and extremely corrosive gas that would have quickly damaged the production and agent filling installations. Hexamine binds this acid, and does so more efficiently than other amino compounds. However, recent discussions with officials from some Western states who are involved in the analysis of Syria’s declarations indicate two other roles of hexamine, namely as catalyst and stabiliser. The catalyst function is probably closely tied to the acid scrubber role. In an e-mail exchange today, Ralf Trapp, a chemist and consultant to the OPCW, confirmed that hexamine increases the yield of the chemical reaction by pulling the equilibrium between the precursors and reaction product (sarin) in favour of the latter. As a result, the sarin concentration receives a significant boost, possibly up to 60%. This degree of purity is considerably higher than the yields achieved by Iraq in the 1980s. As a stabiliser, hexamine probably allowed the Syrians to store freshly produced sarin for days, if not several weeks. This understanding is more compatible with views before the civil war that Syria’s CW served strategic deterrence. Munitions declared to the OPCW last autumn also seem to validate those views. Initiating the final reaction shortly before use, as was the case in Iraq, would have undermined this doctrinal role. The insight also raises fresh questions about the curious White House claim last August that the United States had observed Syrian preparations for three days prior to the Ghouta attacks. Strictly speaking, the chemical analysis of the sarin in the two ACW confirms beyond any doubt that the nerve agent was produced by means of the same process as the one used by the Syrian government. The distinctive signature, however, cannot exclude the possibility that insurgents might have captured some CW. Western officials tend not to give much credence to this hypothesis. Castor beans: cancer research, castor oil, or ricin? The latest monthly progress report also reveals that on 14 July Syria submitted yet another amendment to its initial declaration. The document lists a dedicated ricin production plant. As a weapon the toxin is banned under both the Biological and Toxin Weapons Convention (BTWC) and the CWC. The CWC requires the verified destruction of CW production facilities, but the amendment claims that it is located in an area not under government control. It also states that the entire quantity of ricin produced was eliminated prior to the entry into force of the CWC for Syria. If correct, then Syria need not declare its past toxin weapon holding. CW disarmament in Syria, however, is hardly a normal operation. As with its claimed destruction of 200 tonnes of mustard agent early in 2013, the OPCW must investigate those statements to ascertain that the country is not hiding any residual CW. This progress report was the first to publicly mention ricin production. Last April concerns about the toxin had already filtered out of the United Nations, but they have thus far remained a relatively low-level matter at the OPCW. This was in part a consequence of the high-priority preoccupation with getting the precursor chemicals out of Syria, and in part because nothing seems to indicate that the country presently has ricin weapons. Questions remain nonetheless. Syria apparently cultivated castor oil plants (Ricinus communis) on several tracts the size of football fields. In itself, this is no so unusual as the oil makes for an excellent lubricant for heavy engines, such as those in military lorries. However, Syria’s initial explanation referred to cancer research and treatment, which was wholly implausible in view of the minute quantities of ricin required for research. Castor oil also lacks any medicinal value to cure cancer. It was used to deliver some chemotherapy drugs to tumours, but occasional side effects, such as allergic reactions, have led to the adoption of alternatives. Starting in the 1980s, Texas Tech University and Texas Tech University Health Sciences Center conducted long-term research on the oncological application of genetically modified ricin to kill diseased cells. According to a press release of October 1998, ‘just two acres of land, given the right castor seed, could produce enough ricin to meet the world’s pharmaceutical supply need for cancer treatment’. Ricin is also being investigated in relation to neurological degenerative disorders and in the treatment of intractable painful neuropathies. It is rather hard to think of Syria as a global supplier of medicinal ricin many times over. This leaves the question of ricin as a weapon. Ricin is an instrument of choice for assassinations, as befell Bulgarian dissident writer Georgi Markov in London in 1978. More recently clumsy attempts to send ricin-filled letters to hated persons, including President Barack Obama, have also put the spotlight on the agent. Since the First World War many states considered ricin as a possible tool of warfare, but they have never incorporated it as a standard agent into their chemical and biological warfare arsenals. Despite the military attractiveness of its toxicity, the toxin poses several serious problems in relation to large-scale production, longer-term storage (unless turned into a solid), and dissemination techniques. While none of these problems are insurmountable, the net effect is that the agent is more cumbersome to weaponise or less effective on the battlefield than alternatives. Right now the reason behind Syria’s declaration of a CW production facility exclusively dedicated to ricin manufacture remains murky. On the one hand, in view of the many publicly available accounts describing the many difficulties of producing and especially storing the toxin in free state for longer periods of time, it almost seems implausible that Syria would have embarked on a major ricin weapon programme. Interestingly, several Western officials I recently spoke to tend to discount public Israeli reports on Syria’s ricin programme. The annual US State Department report on arms control treaty compliance for 2014 dropped the reference to ricin-based biological weapons in the BTWC section and does not mention the toxin in the separate CWC compliance report. The 2013 treaty compliance document still stated: ‘In 2004, Israel’s Intelligence and Terrorism Information Center said in a report on Syria that the Scientific Studies and Research Center had been developing ricin-based biological weapons’. On the other hand, if the Syrian factory was indeed dedicated to the production of oil or lubricants, the possibility exists that it used a cold hydraulic pressing technique, in which case 1–5% by weight of ricin might remain in the resulting mash. A fact sheet on ricin by the OPCW Science Advisory Board (SAB) released in February 2014 notes that castor oil production plants are not subject to Schedule 1 inspections under Article VI of the CWC. The SAB therefore recommended that the Director-General encourage National Authorities in producing countries to promote hot pressing and other techniques that ensure inactivation of residual ricin in the waste mash. In other words, the Syrian amendment might reflect a compromise with the OPCW to remove any ambiguity about the purpose of the ricin resulting from a particular production process in view of the need for absolute certainty that all aspects of the country’s CW programme have been eliminated. A future oil-extraction plant using a process that inactivates residual ricin could then be constructed without the need for long-term verification modalities for that installation. A possible explanation for the ricin factory declaration for sure, but more details are required to confirm the scenario. To be continued. And the destruction of mustard agent? As I reported in May, OPCW inspectors were looking into Syria’s claim earlier this year that it had destroyed some 200 tonnes of mustard agent in the spring of 2013. They are still trying to obtain further documentation substantiating these destruction operations. Onsite inspections of the disposal sites are still pending before this particular file can be closed. This entry was posted in Chemical and tagged CW destruction, CWC, Disarmament, Mustard agent, OPCW, Ricin, Sarin, Syria, Verification, War on 11 August 2014 by JP Zanders. Your latest information indicates a distinct species of Sarin. At the closed session @ the UNSC 9/13, it was revealed the Syrian Govt claimed Hexamine substituted for Isopropylamine re: a formula for Sarin. The problem the UN HRC CoI faced is establishing the Sarin was prepared for and used by the Govt. That is still missing from that dossier of evidence despite the Syrian Govt supplying a wealth of detail & physical evidence establishing the circumstantial case against the regime. Would the Assad Govt. be so helpful if they appreciated the significance as they simultaneously insist that their own audits have established nothing is missing? Sellstrom’s early thoughts contemplated the agency of ultra-loyalists. Other questions relate to the Govt’s demolition of CW facilities, made necessary because of reverses on the battlefield and your idea of storable Sarin may explain the existence of the weapon at a time it would be difficult to produce for a Just-in-time deployment. I think the people who used the Sarin were in possession of all of it. I don’t think anybody seriously entertains the idea a sub-quantity was stolen. No squabble with that. The main thrust of my posting is (1) Syria declared two ACW to the OPCW, thereby suggesting that somebody else had control over (part of) the stocks, and (2) subsequent analysis of the sarin revealed hexamine, which is unique to the Syrian government process. The third point is that it has been determined that hexamine served two other goals than just being a substitute for isopropylamine. In terms of your UNSC closed session, please note that this was on the Ghouta attacks. The UN investigative team was back in Syria at the end of September to investigate the Jobar allegation, which is when the IEDs were seen as noted in its December final report. Analysis of the ACW contents was done by the OPCW for the OPCW as part of the disarmament project. If the OPCW accepts the Syrian destruction plan, then Syria will have to undertake this task under OPCW supervision. The reference to the report by the UN investigative team concerns the types of munition Syria declared as abandonned chemical weapons. The OPCW carried out separate chemical analyses on its contents (as stated in the posting), the results of which are not in the public domain. The hexamine presence was confirmed in several discussions I have had over the past two months with people closely following the Syria dossier, including government officials, diplomats and scientists.